Brand new from the Adidas NBA Authentic Collection this 100% 4.7 oz. Climalite polyester anti-Microbial Indiana Pacers Synthetic Long Sleeve Official Practice T shirt keeps you cool and dry during your workout and also helps to keep you smelling good no matter what your activity. 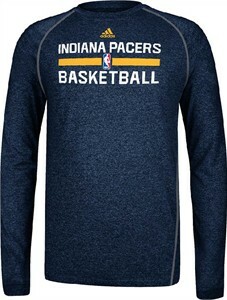 An official NBA authentic practice shirt for the Pacers this heather navy LS Top comes with an loose-fit body to allow you room to move on the court and features side taping and new screened Adidas, NBA, and Pacers front chest logos.